The first Canadian Copper Company Smelter was originally called the East Smelter and later referred to as the ‘old’ smelter. The smelter was completed the day before Christmas 1888, but owing to a fault in construction regular work had not commenced until February, 1889. Matte was produced from Evans and Stobie mines ore. The East Smelter was destroyed by fire in 1902. The settlement called the East Smelter was closer to the Big Nickel turn-off. The Johnson Extension was south of Highway 17 near the railroad tracks. These settlements no longer exist. However, in the late 1800’s there was a vibrant, multicultural; community of Ukrainians, Poles, and Anglo-saxons living there. The East Smelter settlement included Elizabeth Street (west from Copper Cliff Road), Main Street (north south to the Copper Cliff Road) and Mine Street (north from Main). The Johnson extension included Railway Street (from the west end of Elizabeth), and Johnson Street (from CPR old Smelter). Dan McKinnon opened a boarding house at the East Smelter site. Joe Martel was kept busy playing his fine old violin for dances. See Places - Evans Mine. Simeon Doyon, sometimes called Sam Doyle, alternated with Joe Martel as a fiddler of consequence. At the McKinnon boarding house, which was a store too, a makeshift stage was set up. The first play in Copper Cliff was produced about 1888 at the McKinnon boarding house where a brave band of local thespians trod a makeshift stage and drew thunderous applause for their efforts. Phil Green, a general store manager in Copper Cliff, was the star actor. Proceeds were turned over to the church. Simeon 'Samuel' Doyon was born September 13, 1863 at St. Joseph deBeauce in Quebec. From the 1901 Census of Drury, Denison and Graham, Samuel Doyon was ‘Conducteur De Gelieroner’, with his wife Matilda (Marie Mathilda Girard), age 23, (born November 25, 1877 at Baie de Milles-Vaches, in Quebec) and their children Mathilda Sévérina, (born 1896) age 4, Marie-Louise Emilda, born in Copper Cliff 1897, age 3, Joseph Simeon, (born 1898) age 2 and Rose-Annie Victoria, (born 1900) 8 months. Other children were 'Louis' Thomas Emmanuel (born 1902), Joseph Romeo 'Wilfred' (born 1903), Cyrille S. (born 1905), Marie 'Corinne' Jean (born 1906), Henri (born 1908), Joseph Pierre 'Napoleon' (born 1910), Albertine (born 1912), Cecile (born 1913), and Malvina Marie 'Blanche' (born 1914). Rosa Annie, 8 years of age and Malvina, 5 years of age, both died of diphtheria. Matilda died in childbirth in 1918 at Victoria Mines. From the 1891 Census of McKim and Chisholm Township, Daniel Laughlin McKinnon, age 36, born in Marmora, Ontario, General Store, his wife Ellen Celina Price, age 30, daughter Catherine, age 5, son James, age 3, and Charles Puice, age 28, lodger and clerk in General Store. From the 1901 Census of Copper Cliff, Daniel McKinnon, age 46, his wife Hellen, age 40, daughter Kattie, age 15, sons ‘Harry’ Joseph Henry and Cleveland. From the 1911 Census of Larch Street, Sudbury Daniel McKinnon, age 56, born November 1854 in Ontario, Merchant, his wife Ellen, age 51, daughter Kathryn, age 25, son Harry, age 23 and son Daniel Cleveland, age 18. In 1902 in the East Smelter village, the general manager, Jim McArthur, had a fine residence there and Tom Kilpatrick, foreman, had one close by. James McArthur was born November 14, 1855 in Glasgow, Lanarkshire. James married Elizabeth Gorringe, they had two sons Edmond, born 1882 and Norman, born 1888. From the 1891 Census of McKim and Chisholm Township, James McArthur, age 45, his wife Elizabeth, brother Fredrick, age 21 and sons Edmond, age 9 and Norman, age 3. From the 1901 Census of McKim Township, James Allan McArthur, age 45, emigrated in 1875, Scotish origin, occupation Canadian Pacific Railway General Manager, employed for 12 months earning $3,000, his wife Elizabeth, age 40, born in England, emigrated in 1875, and their sons Eddie, age 19 and Norman, age 14. From the 1901 Census of McKim Township, Thos Nichol Kilpatrick, age 33, born August 16, 1867 in Ontario, Scotish origin, occupation Smelter Superintendent, his wife Elizabeth Lizzie (Fraser), age 28, their children Peter, age 6, Jane, age 4, Fraser, age 3 and Thomas’ mother Marion Nichol Kilpatrick, age 76, born in Scotland. From the 1911 Census of John Street, Sudbury Thomas Kilpatrick, age 43, occupation Prospector, his wife Elizabeth, age 39, son Peter, age 15, daughter Jean, age 15, sons Fraser, age 13, Kenneth, age 8 and John, age 5 and daughter Catherine, age 3, and Relane Davion, domestic. Thomas Fraser, born in 1897. Thomas was an insurance agent and he enlisted in World War I. in 1922, at age 25, Thomas died on the Copper Cliff Road of a fractured skull and hemorrhage. Thomas’ brother William, a stationary engineer also worked in Copper Cliff and raised his family there. In 1911 on Elizabeth Street (east of the Old Smelter) there were two grocers F. Turpin and Wasyl Buczousky (Buchowski). By 1914, their stores were located at 11 and 12 Main Street, respectively. Peter Boyuk took over the store at 11 Main Street and Wasyl lived at 12 Main Street. Peter Christoff, a baker was at 15 Main Street. Wasyl (Basilli) (Buczowski) Buchowski married Olena (Helen) Bodnaruk in 1899 in Kuty, Ukraine. Wasyl Buchowski came to Canada from the village of Serafyntsi, in the Ukraine, in 1904 and settled in Copper Cliff at 139 East Smelter Road. He owned a Ukrainian general store. His wife and son arrived in 1910. Volodymyr Wasyl (Walter) (William) Buchowski, born in 1901. He died at age 30. Evhen (Eugene) Buchowski born in 1911. He married Annie Suhonos on September 4, 1938. Hrehory Stefan (Harry Steve) Buchowski was born in 1914. Levko (Leo) Buchowski was born in 1915. He married Jospehine (Josie) Piche in 1949. From the 1911 Census of 39 East Smelter, Copper Cliff, Waylt Buchowski, age 42, born February 1869 in Galicia, origin Ruthenian, Nationality Austrian, occupation retail merchant general store, immigrated in 1904. His wife Helen Buchowski immigrated in 1910, origin Ruthenian, Najhe Buchowski, age 13, Walliam Buchowski, age 7 and Peter Slemkssiton, age 22, salesman in general store, immigrated in 1906, employed 52 weeks earning $600. and Mary Slemkssiton, age 18. Galicia is a historical region in Central Europe that presently straddles the border between Poland and Ukraine. The store represented one of the only community spaces for Ukrainians who lived in Copper Cliff at this time. It was a place where Ukrainians could meet to share news about the Old World, as well as local activities, and politics. The store was quite successful up until November 1917. The business found itself in a serious crisis because of the enemy alien wartime measures. By extending credit to the wives of those who were jobless or interned because of their enemy alien status, the store came close to going bankrupt before it was burned. A fire on November 19th destroyed the store. Married Ukrainian miners and their wives took in boarders or lodgers. In 1910 seven Ukrainina families on Elizabeth Street lodged eighty-six single men. Annie Buchowski was born in 1913 and died shortly after birth. John Buchowski was born in 1929. He married Mary Wisniewski on November 7, 1964 in Sudbury. Although John’s early days were spent working in the store alongside his relatives, it was not long before he got a job at the Smelter in Copper Cliff. John was aligned with the Federation of Ukrainian Social Democrats (FUSD). However, this had serious implications for workers. John “got blackballed” as a communist and lost his job a couple of years later. Progressives, who were mostly men, began meeting in 1913 in Copper Cliff, calling themselves the Federation of Ukrainian Social Democrats (FUSD), then the Ukrainian Social Democratic Party (USDP) in 1914, the Ukrainian Labour Temple Association (ULTA) in 1918 and finally, the Ukrainian Labour Farmer Temple Association (ULFTA) in 1924. Also on Main Street was the office of the Copper Cliff Courier. Matt Bell won the race, he had been a member of the Clydebank Harriers in Scotland and came to Copper Cliff in 1906. The race went from the top of Serpentine Street to the Jacob store (opposite Silverman’s) in Sudbury. Other runners were Sam Boyd, Fred Dubery, Tommy Linton, and Howard Rowe. After the fire in Shantytown, the Finland Hall property became the site of the Copper Cliff Dairy. A new Finland Hall was built by the socialists (the Socialist Party of Canada) in 1916 on privately owned land at 29 Main Street in the East Smelter neighbourhood, outside of the town limits. After 1918, the Young People’s Society changed their name to the Copper Cliff Finnish Social Society. When the Social Society’s hall was purchased by Inco in 1923 for slag-dumping, the Halfway Hall was erected between Copper Cliff and Sudbury. This hall was destroyed by fire in 1928. From ‘Between a Rock and a Hard Place’ by Oiva W. Saarinen. Pete Marco of 22 Main Street, was a watchmaker. From the 1911 Census of East Smelter, McKim Township, Peter Marco, age 23, was born in July of 1887 in Galicia, immigrated 1906, origin Ruthenian, nationality Austrian, occupation barber shop, employed 52 weeks earning $600. and three boarders: Basyl Petchurto, age 26, born May 1885, immigrated in 1910, occupation baker; William Menkan, age 19, born September 1891, immigrated in 1910, occupation baker and George Halunchuk, age 23, born August 1887, immigrated in 1907, occupation teamster. In April 1915 a fire demolished an 86 by 46 foot building at the old smelter, known as Pete Marco’s block. It had a poolroom, a barber shop, a butcher shop, and a boarding house. Twenty-five people were sleeping there at the time of the fire. They escaped. 23 A Main Street was a general store run by I. Weinstein. Alexander Justin Yandon was born on August 21, 1907 in the East Smelter. His father Justin was a carpenter, his mother was Georgina Smith. "I was born at the old East smelter in Copper Cliff" said Alex Yandon. "There was quite a bunch of houses there then, but you'd never suspect it now. Some bits of brick foundations sticking out of the slag dump here and there are all that remain of those old days." Alex started with Inco in 1920 as office boy. "E. C. Lambert gave me my first job," he recalled. In 1923 he transferred to the carpenter shop, and took his apprenticeship as a pattern maker, at which he served out his time. Alex's father Justin, who was an Inco man too, lost his life in the great fire at Dome in 1911. He was on loan to that mine at the time. William Leslie born September 7, 1901 in Ottawa, Ontario. Prior to enlistment William Leslie was a miner. He was with the 227th Battalion. From the Sudbury Star July 20, 1918 “Copper Cliff Royal Cadets held a reception; back from France, spent 6 months”. Sudbury Star July 28, 1918 “welcome home reception; went overseas when 14 years old”, Sudbury Star August 6, 1919 “joins North West Mounted Police”. 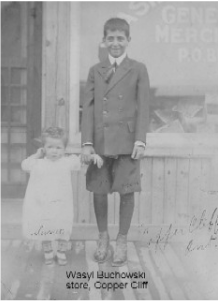 Alexander Justin born August 21, 1906 in Copper Cliff. Alex married Irene Sargent. Her father Harry worked for the company and operated a barbershop on Serpentine Street for 16 years. In July 11, 1911, the Porcupine forest fire took 73 lives, including Justin Yandon. This was the height of the gold rush at Porcupine. Other Copper Cliff casualties in the fire were Arthur Athoa, Petro De Paulo and Victor Dera, all burned to death; Thomas Curry King who was at the Dome Mine also died. The Albert Medal for Lifesaving was a British medal awarded to recognize the saving of life. Richard Michael Gutcher was born September 29, 1852 in Renfrew, Ontario. At age 61 he died on April 18, 1914 at the Dome Mine, Timiskaming South Porcupine. Richard was a carpenter. Timmins, Ontario. Ferdinand 'Frederick' 'Fred' Turpin was born April 24, 1845. He married Olivine Darragon Lafrance on April 10, 1870 in Embrun, Ontario. In 1914 12 and 24 Railway Street were vacant. William Wingfield lived at 26 and William Eddy lived at 28 Railway Street. In 1916 Peter Herkost lived at 35 Johnson Street. Sault train behind Railway Street. Photo Private Collection Marlene and Marty Neva. Robert John born March 1, 1909. Since 1920, John Robert was employed with the Sudbury Brewing and Malting Company as a stationary engineer. He traveled daily to work by street car from his residence at Uttley's Corner, a group of three houses a quarter of a mile east of Copper Cliff. He worked until age 90. 4 Generation Photo Left Standing - Katherine Stinson Uttley, Right Standing - daughter Hazel Uttley Bodson, Seated - mother Agnes Stinson holding Hazel’s child at 26 Railway Street. Photo Private Collection Marlene and Marty Neva. Nathan Crawford Uttley with his mother Kathryn Uttley, at time of enlistment World War II. Photo Private Collection Marlene and Marty Neva. April 29, 1916, "Two houses were burned at the Old Smelter yesterday morning between 1 and 2 o'clock and are a total loss with their contents. The houses belonged to Nicolo Siminoff and his brother, the former having to jump from an upstairs window to escape. They were frame structures and were soon licked up by the flames, despite the efforts of the firemen, who were soon on the ground. It is said the loss is fully covered by insurance and that incendiarism is suspected. The owners are Bulgarians and their houses were situated on private property." In November of 1917 two stores at the Old Smelter were destroyed by fire. In July 1921, Elizabeth Street, known as the East Smelter village, was the scene of a fire which destroyed three of the half dozen houses left, numbers 4, 6 and 10. The bucket brigade worked strenuously to save the others. Smelter workers found those rickety dwellings handy to their jobs. By 1930 Main Street was part of the Slag Dump, and there was no Elizabeth Street. The Johnson Extension consisted of No. 26 Railway Wm Uttley, No. 28 Jos Bodson; and by 1940 No. 24 Railway was Hector Rochon. In 1954 there were three houses left on what was known as Railway Street.